Let Your Yoga Dance® is a moving celebration of spirit. It’s a unique approach to movement, combining the time-honored traditions of yoga, user-friendly dance, meditation in motion, breath, and the chakra system (the body’s energy centers). It’s funky and fun: sometimes wild and filled with abandon, sometimes quiet and still. Inspired by music from around the world. We are all dancers!! All ages welcome, from 17 to 90. If you have physical issues or have trouble standing, you can dance in a chair. Wear comfy clothes and bring a water bottle and an open heart and mind. 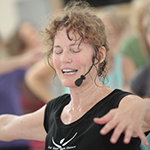 Along with being CJO (Chief Joy Officer) of Let Your Yoga Dance®, Megha Nancy Buttenheim, MA, ERYT 1000, is a 30-year teacher trainer and faculty member at Kripalu Center for Yoga and Health in Stockbridge, Massachusetts. She is the author of Expanding Joy: Let Your Yoga Dance, Embodying Positive Psychology. She teaches trainings in this practice for “regular” populations, special populations, and kids & teens. Megha is a three-time recipient of a generous grant from the American Parkinson’s Disease Association in order to teach weekly Let Your Yoga Dance® classes for people with Parkinson’s, both in Pittsfield, MA and Sarasota, Florida.